New CallRec.me Available in the App Store! New version of CallRec.me is available in App Store as a free download! CallRec.me is the easiest and fastest way for recording phone calls on your iPhone. It can record both incoming and outgoing phone calls, and the latest version brings some exciting new features that you asked for. It is like Skype + recording, but easier. When you wish to call someone and record that call, all you need to do is to enter the phone number and push the Record button. CallRec.me will dial the number directly and record the conversation without going through intermediate access number. You can call and record calls over the WiFi network - you don't even need to have a data plan or 3G coverage if you are near the WiFi hotspot. Yes, it works just like Skype - but with recording. You can use CallRec.me not only for recording phone calls, but for taking quick voice notes, memos, recording meetings, to do lists... Just tap the Record button and talk away - everything you say will be recorded and preserved along with your phone calls. And best of all - recording voice memos is free! With CallRec.me you can share your recorded calls or voice memos with your friends on Facebook, Twitter or via email. Latest version features an integrated audio player for listening to recorded conversations. Play, pause, forward, rewind and other playback options that you expect are there, just below the list of your recordings. 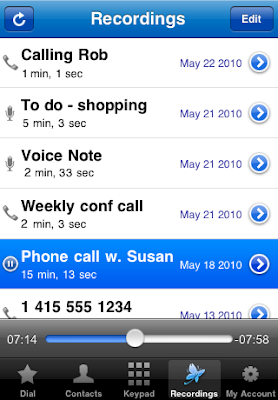 With CallRec.me you can order transcriptions of your recorded phone calls. There are two types of transcriptions you can use: human transcriptions that are 99.9% accurate but may take some time to be delivered, and machine transcriptions that are not that accurate, but are faster to get (and much more funny). Get the brand new CallRec.me on your iPhone now, and start recording your phone calls!